Cook the split pigeon peas using the pressure cooker or the stove top until it is soft and mushy. Mash these lentils with the back of a large spoon and keep aside. Grind, coconut, cumin seeds and dry red chilies to a smooth paste and keep aside. Soak the split chick pea lentil for 20 to 30 minutes.In a large heavy bottomed pan cook the chick pea lentils adding water as required until it is soft, yet firm and retains its shape. When split chick pea lentil is ready, add asparagus, turmeric powder and more water if required and allow it to cook until asparagus is soft, yet firm. When the asparagus is cooked, add salt to taste and allow to simmer for an additional couple of minutes. Add cooked and mashed lentils, coconut paste and allow to simmer for a few minutes until all the flavors blend. In a small pan, heat oil, add mustard seeds, when the seeds begin to splutter, add split black gram lentil. When the lentils begin to turn reddish, add asafoetida powder, mix once or twice and pour entire seasoning on the asparagus curry. Allow to simmer another additional minute or so and remove from heat. 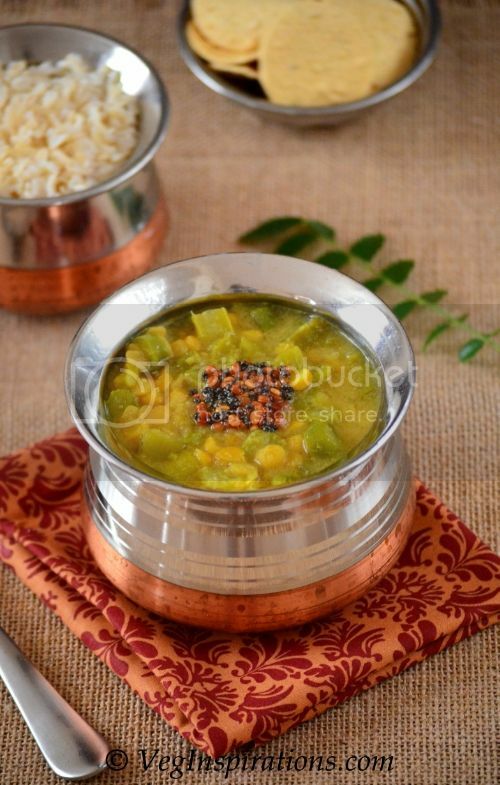 Serve hot with rice and rasam or sambar, or serve to go with some phulkas/ rotis.